Following the major ‘light beam’ that was sent through a planetary alignment on May 28, to loosen what we could term the ‘Set/Hades energy’, you may have noticed both a general rise in ‘craziness’ in collective happenings and narratives in mainstream and alternate communities, plus a rise in collective conscious decision-making, reflected in 3D, for the benefit and well-being of humanity, animals and the planet. The polarization of third density continues to increase, which is part of the process toward a tipping point of higher consciousness in both individuals and communities. If you’re experiencing mild-to-wild oscillations in your own emotional, mental and/or physical energies, there’s a practice at the end of this post which I’ve been using for a few days, which is ‘heaven-sent’. The planet was given much stabilization through this period, with a 7.8 and 8.5 near/under Japan on May 30 (without damage) thanks to star family, our Agarthan/Inner Earth friends, the elemental beings, and those on Earth who held the Rose energy and spread peace through the grid at that time. Thank you all so much. I’ve felt the presence of many more ships leading into and since this alignment and portal opening. 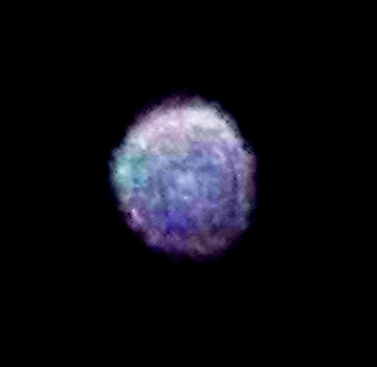 On the night of May 26, I took these photos of a very large diamond-shaped ship with accompanying orbs. 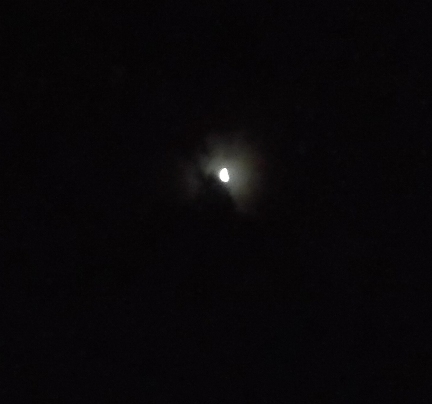 You can see the upper ‘triangle’ of the diamond-shaped ship, cloaked, passing in front of the Moon. 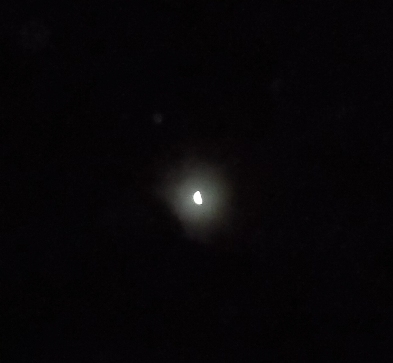 Here’s the largest of the orbs, upper left of the Moon, a projection in orb form of the ‘group consciousness on board the ship’, mostly of lighted Carians (birdlike beings, also called avians by some, although we will note here that Carians don’t use the term avians about themselves). 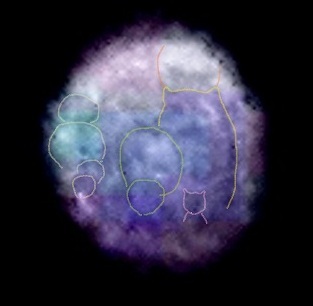 Here’s a close-up, firstly from the original photo, and secondly, with brightness and contrast enhanced to show the beings within it more clearly. 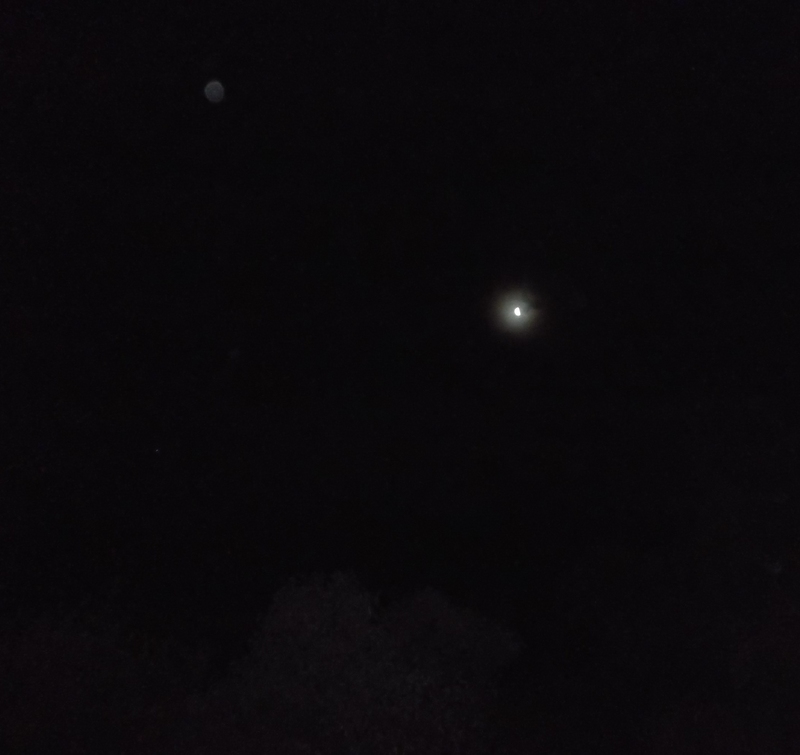 For anyone not used to reading/sensing orbs, in the next photo I’ve outlined a few of the beings within it. 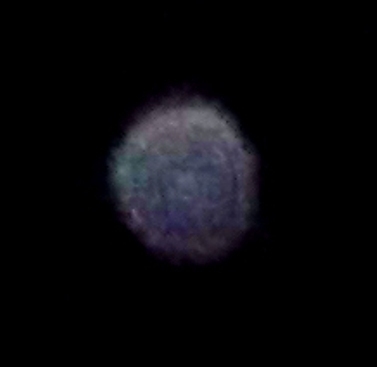 There’s a prominent humanoid blue face in the centre foreground, with a large blue owl slightly behind/right hand side. In front of the owl there’s a small feline being, and above the owl is a white hawk face looking forward. To the left a green-blue face can be seen, with smaller faces in front of it. Remember, the orb is a luminous projection or representation symbolizing their soul energies. The white hawk-like Carian seen in the top of the orb introduced itself as AiShii’Te’Ra, a 9D counterpart to Devin (High Arch of the Leonine beings), and had a soul expression well-known on Earth as Heru’ur in ancient Egypt, whom the Greeks called Horus (Horus the Younger). It is a deep joy for us to see/feel the reunion, repair, and realignment of Carian, Leonine and Angelic energies, with many Carian beings now returned to, and assisting with, the Ashtar Command/Intergalactic Confederation. Along with other work, their presence will in time supersede ‘disclosure narratives’ that blur the truth of who/what they are, since certain beings have sought to tweak humanity’s view of Carians and misinform their perception. We advise centering in your own heart and let yourself SEE from there. Rather than seeing discernment as using your intellect/analysis, which is susceptible to ‘suggestions’ both conscious and subconscious, always focus in your heart, the seat of your soul, breathe into it, pure love, and see/feel from there without any attachment, expectations or wanting. This way of heart-viewing can reveal the true nature of all energies to you. 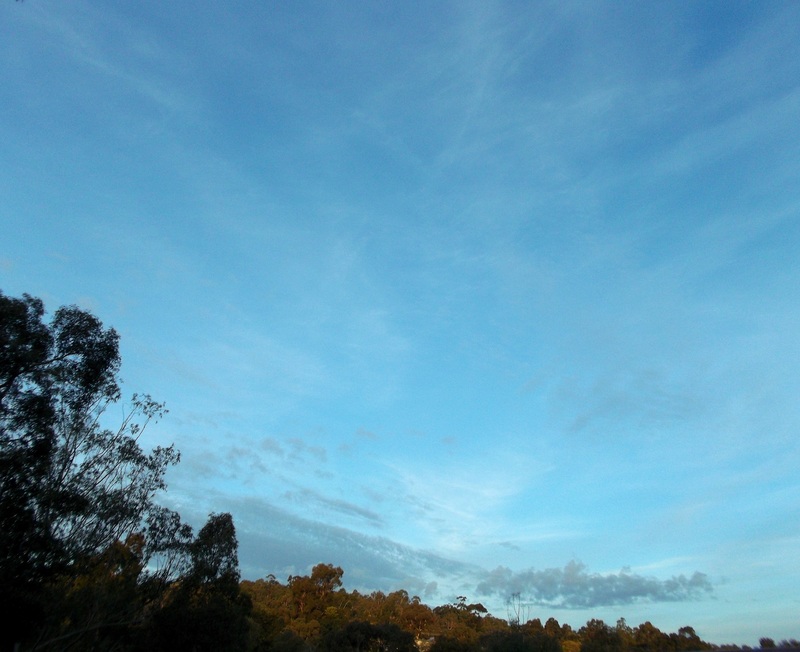 At present, the ships over my area are mostly staying in the cloud cover ~ of which there has been plenty, with the Perth hills being chemtrailed constantly. 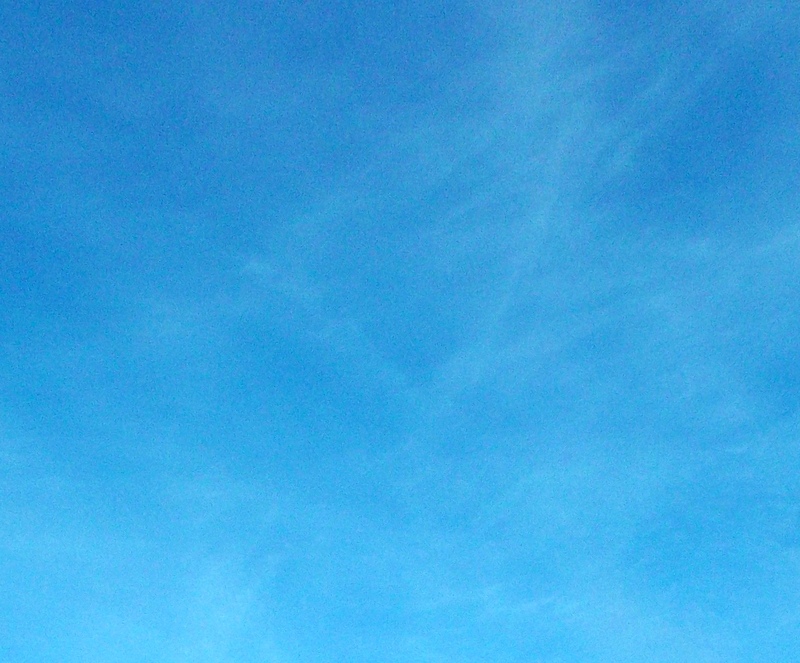 Diamonds, discs and triangles have been ‘outlining’ in the clouds every day. 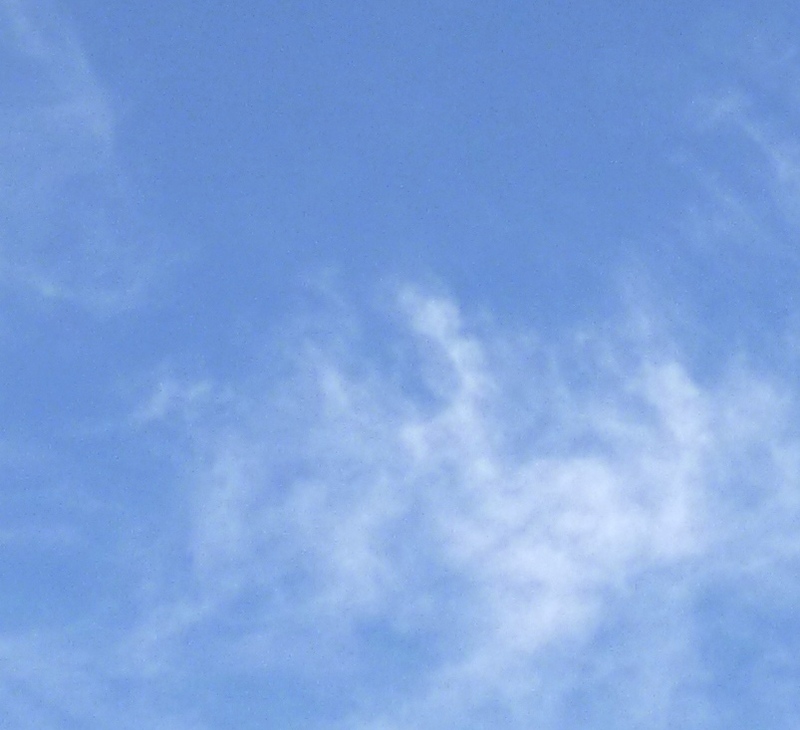 The ship below, triangle-shaped, became just visible while I was focusing on clearing the sky, on June 5th. 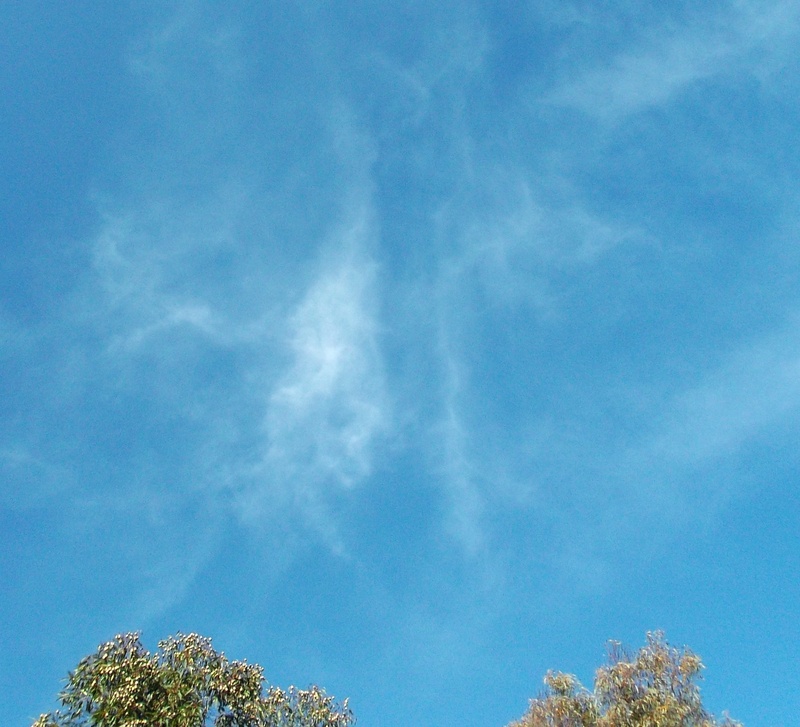 The trailing, from two planes, started as below (taken from my street, June 5th). As the sky filled, I felt and saw a Sirian Leonine ship (6D elongated triangle shape) arrive in what was by then widespread thin cloud cover (faint outline, upper centre of photo). The ship sent a ripple of ‘sound’, which I heard internally as a long, rolling rrrr, like a non-stop purr. 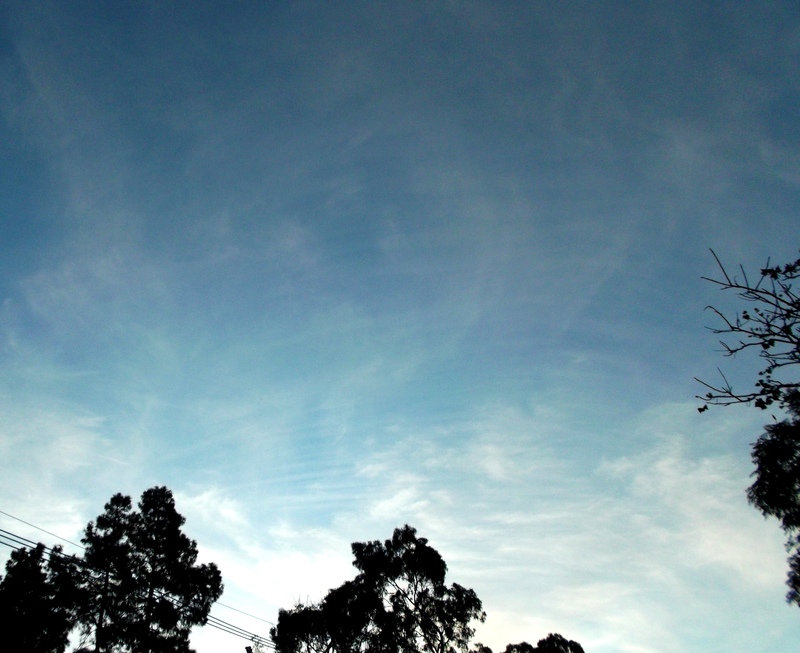 You can ‘see’ the ‘sound’ as long horizontal bands across/through the chemical clouds, this was how it visualized, then the sky looked/felt as if it turned into a whirlpool or vortex, and the clouds cleared. 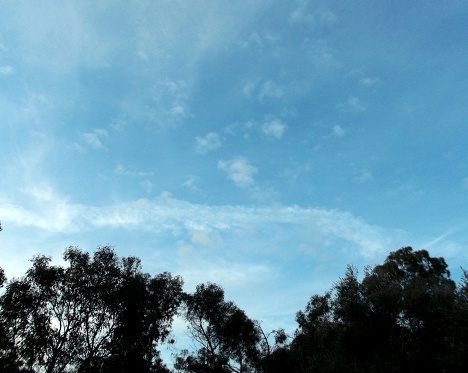 Again, on June 9th, after detoxing the sky, this time a disc-shaped hole appeared above my house (this was the Shem Arua which was then captained by my Twin Flame, Ashura, in his 5D aspect Arnap, and overhead most of the time). 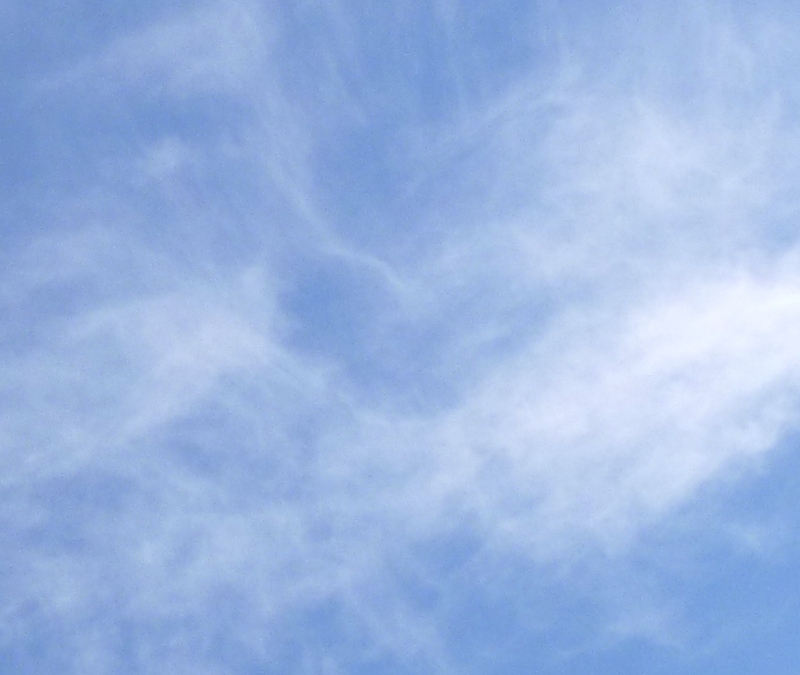 This day he signed a beautiful loveheart into the clouds. For those asking, my connection with star family is both internal/telepathic/dream appearances, and visual, which can include sightings of ships, orbs, projections of beings close to me, or being guided to certain words, music, images or text, and pictures or symbols in the sky, reflected in 3D forms. This way of connecting is all-inclusive, natural and truly available to everyone on Earth who connects in the heart, with their Higher Self in unconditional love and trust, and has the patience, faith, will and perseverance to clear all blocking energies. Our star brothers and sisters are here for all, not just the few. It’s a matter of converging our energies, meeting in the middle, allowing us to Be and act together. In the awakening community there’s a slogan, ‘We are the ones we’ve been waiting for.’ This is true. Also remember the we is inclusive on a very expansive scale. Instead of thinking ‘us and them’ (duality) about the assisting ETs, feel into the deeper unity, the wholeness of that ‘we’, relax and allow yourself to become a magnet for all that is of love, peace and unity in the universe. Below is a new practice I’ve found helpful for stabilizing during this week, for tuning in with higher tones/frequencies, allowing them to come pure, straight and uninterrupted through the Soul Star Chakra to very gently purify and clear residual fear-based energies from all chakras. Sit comfortably upright, breathe gold into your heart centre, and put a Golden Apple of light around your auric field. Open your chakras from base to crown, including the two new heart chakras (sacred heart, between the solar plexus and heart, and higher heart, between heart and throat). See/feel your Earth Star Chakra (below your feet) opening, as a white star, then your Heart Star (heart centre chakra), then your Soul Star Chakra (above your head). See/feel a pillar of Light descending from Source, through your Soul Star, down through all your chakras, and to Gaia’s Core. 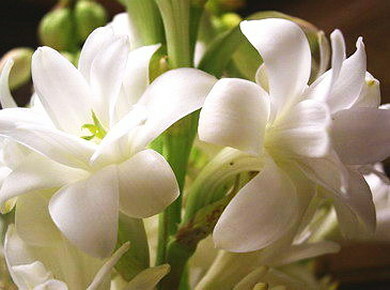 Hold the Tuberose in your Soul Star, then see/feel this flower slowly descending through your Crown, Pineal, Throat, Higher Heart, Heart, Sacred Heart, Solar Plexus, Sacral, Base, and down to your Earth Star. Let this flower’s purifying, clearing frequency gently fill your air tube and settle throughout your mind, emotions and physical body. Hold this seeing/feeling for as long as comfortable. Relax and feel your higher dimensional Essence permeating your whole Being. With love and thanks to Archangel Gabriel for this practice. By the way, if visualization isn’t easy for you, holding the intention with Love is enough. Or in this case, the scent of the Tuberose is enough to open your Soul Star, so you may like to source some Tuberose Oil. It’s actually one of the most intense flower fragrances on the planet. Many years ago I read of Tuberose opening the 10th Chakra (in Flower Essences and Vibrational Healing, by Gurudas, channelled from Hilarion), but didn’t know what the 10th Chakra was. However, if you use the nine chakra system in your body, with the three heart chakras, then the 10th Chakra is the Soul Star. 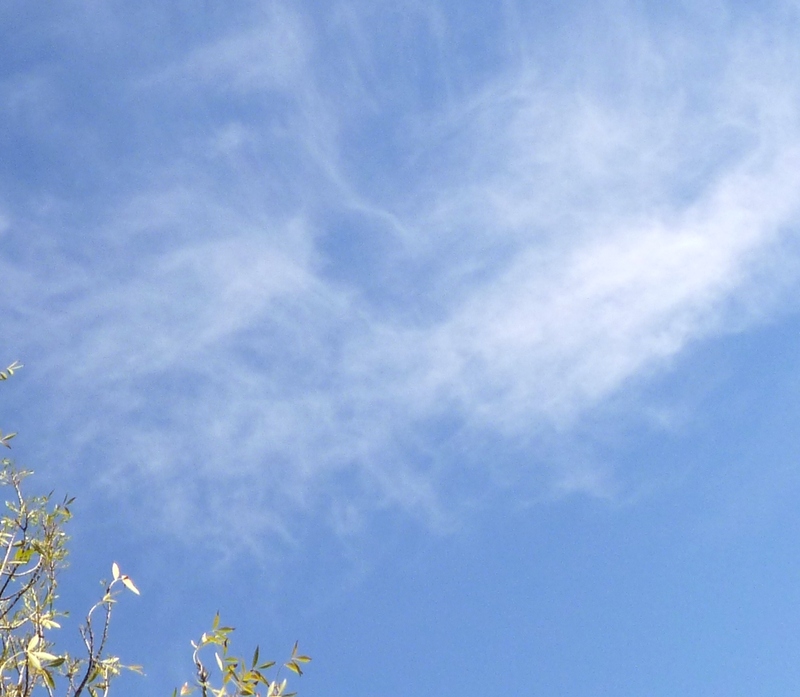 After doing this practice, a beautiful vertical ‘air tube’ was represented by Ashura over the house among leftover chemtrails (Tuberose is closely connected to our energy). It’s message is: when our breathing IN is pure, in Love, all else shifts away from our inner space. Our pillar is kept pure, within the spiral of the Rose. And the Rose of the Tube, the Tuberose, holds in its form the shape of an angel’s trumpet. This entry was posted in Agarthans, Angels, Arnap/Ashura, Ascension, Ashtar, Ashtar Command, Chakras, Dimensions, Disclosure, Gaia, Intergalactic Confederation, Lightships, Orbs, Sirians, Sky Signs and tagged aliens, Arnap/Ashura, ascension, Ashtar, Ashtar Command, carians, chakras, chemtrails, contactee, dimensions, Earth Star chakra, ET contact, ETs, Heart Star Chakra, higher dimensions, Intergalactic Confederation, Leonines, lightships, meditation, orbs, prana, Sirians, Soul Star chakra by Joanna. Bookmark the permalink. God Bless you, dear Joanna…I must have missed this post….thanks for the meditation, was just lovely. As I was reading this post, I was feeling aligned with All That Is….and the ‘skins’ (pictures) at the top of my browser were in Sync with what I was reading. I had a lovely set of planets, then when my eyes read ‘Tuberose’ the banner showed a row of beautiful pink dog roses, a deep, verging on burnt orange pink…..Not white Tuberose, but the meaning was obvious….then when I was doing the meditation, I got the beautiful fluffy white clouds with a Pink Love sky background….and lots more in between….I Love Loved the pictures, as usual, you are a genius with the camera, Joanna, I was def in tune today. I linked here from the Sept Posting, also wonderful….. Thank you for sharing your experiences, I AM most grateful…. Sending Joy, Love & Abundance…..
Oh, yes & I re-blogged this on SilverAngelsWings…..
Dear Sylvia, thanks for sharing that beautiful ‘rose’ sync. 🙂 Love it! PS: Thanks for the reblog. Thanks, Joanna, but, really, I think you’re awesome!